In response to the increasing convergence of technologies in the entertainment industries, this thoroughly updates and revised fourth edition is carefully reorganized and conveniently reformatted. Moreover, the new easy-to-read single-column format makes the volume a more accessible resource for lawyers, students, and industry professionals. The Fourth Edition is divided into two parts--one dealing with general principles and the other dealing with specific entertainment and related industries--and over 50 new cases have been added. The case material covers recent changes in the entertainment business--among them innovation, consolidation, copyright issues, and globalization--and each is analyzed in detail. As the internet grows and becomes a part of everyday life, the laws and legal decisions shaping it will continue to affect entertainment business. Therefore, special attention had been devoted to the Internet and other emerging technologies in this new edition. Supplements are also provided to readers to reflect recent changes and update the current material. This classic casebook is assigned to students at top law schools throughout the country and is utilized as a desk reference by industry professionals. FREE semi-annual supplements are available. FOR THE FIRST TIME THESE SUPPLEMENTS ARE AVAILABLE ONLINE!! "Law and Business of the Entertainment Industry is a comprehensive indispensable guide to the intricacies and pitfalls of the entertainment business." Don Passman Partner, Gang, Tyre, Ramer & Brown, Beverly Hills author of All You Need to Know About the Music Business "I have taught Entertainment Law at the University of Georgia School of Law since 1988, and I have always used Law and Business of the Entertainment Industries. It is a comprehensive survey of relevant cases and materials, and includes excellent questions and editorial observations. One challenge for the editors is the need for frequent updating due to the rapid pace of technological change across industries; thus far, each succeeding edition has built on and improved from the one before, and with the addition of periodic supplements between editions I will surely be able to present the most cutting-edge advances in the classroom. I cannot wait to get my hands on the fourth edition." Bertis Downs, Professor University of Georgia School of Law "An essential text for examining the landscale of both fundamental and landmark court rulings in the entertainment industry." Stan Soocher Editor-in-Chief, Entertainment Law & Finance Department Chair, Music, and Entertainment Industry Studies University of Colorado at Denver "There is simply no other single legal text that covers the major areas of entertainment law with such practical information and scholarly depth that is also written by practicing lawyers who are long recognized as experts in this field." Scott D. Sanders Adjunct Professor Emory University Law School "Over the years, I have used every edition of this book as the primary text for teaching entertainment law. It is a comprehensive, well-organized, and well-written guide through a compiled and voluminous body of law." Kenneth J. Abdo, Esq. DONALD E. BIEDERMAN was Professor of Law and Director of the National Institute of Entertainment & Media Law at Southwestern University School of Law, Los Angeles. MARTIN E. SILFEN is an entertainement attorney and Adjunct Professor of Law at William and Mary Law School. ROBERT C. BERRY is Professor of Law at Boston College Law School. He represents and consults widely in entertainment and sports law. EDWARD P. PIERSON is Executive Vice President of Legal and Business Affairs at Warner/Chappel Music, Inc., Los Angeles, and Adjunct Professor of Law at Southwestern University School of Law. JEANNE A. GLASSER is the Vice President and General Counsel of Mona Lisa Sound, Inc. She is also an original member of iPath.com Attorney Network and Member of the New York Bar. Biederman, Donald E.; Silfen, Martin E.; Berry, Robert C.
4. 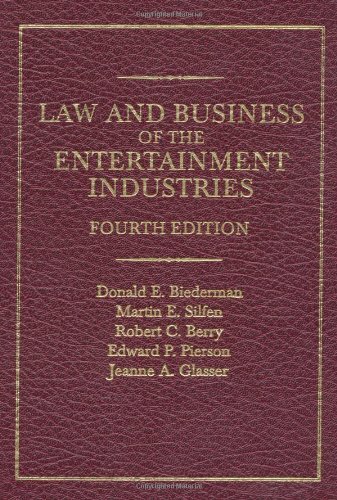 Law and Business of the Entertainment Industries: Fourth Edition Biederman, Donald E.; Silfen, Martin E. and Berry, Robert C.